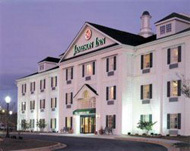 The Jameson Inn features a swimming pool, fitness center, complimentary breakfast with their famous Belgian waffles, free wireless internet access and free daily newspaper. The rooms feature cable TV with premium movie channels, free local calls, microwave, refrigerator and coffee maker. The Inn is near popular Wilmington attractions such as the historic downtown, the Aquarium at Fort Fisher, UNC at Wilmington, Wrightsville Beach and the Cape Fear Museum.